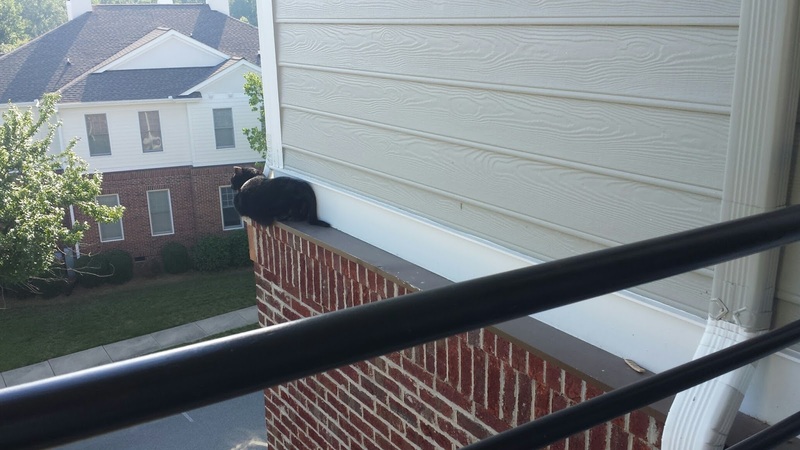 Late one Friday afternoon I got an urgent appeal to rescue an indoor cat named Tucker who climbed out onto a 30 foot high ledge so thin that he couldn't turn around. Tucker's family was moving into a new place that day and Tucker had been put out on the balcony so as to not be underfoot during the move. Turns out one of the movers opened the door to the balcony, which spooked Tucker and caused him to jump over the railing and onto the ledge. 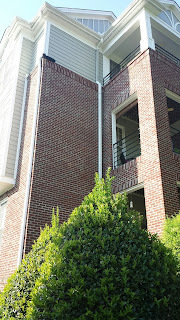 After brainstorming a rescue solution with Tucker's owner and reviewing the attached pictures they emailed to me, we decided the best plan would be to attempt either a net rescue or rescue pole rescue from the nearby balcony. Tucker is a, well, sturdy cat so we were a little concerned about pulling him back over the railing with the poles extended to 10+ feet. Tucker's rescue was very quick since there was no time spent getting into the tree and in position. It was also nice to be able to have help from another person right next to me. I held the rescue pole and the owner, Michael, was right next to me with the net. The most challenging aspect was that Tucker was all the way out at the end of the ledge and couldn't walk forward anymore. I easily got the rescue loop around his neck but there was no way to get his front leg(s) into the loop, too. I tried but that just made him more angry. I had to tighten the loop around his neck and we tried to get him into the rescue net which Michael had positioned right next to Tucker. Tucker wouldn't allow himself to drop into the belly of the net, though, so after a few seconds of trying I opted to pull Tucker to me over the balcony railing. He was a hissing bag of claws at the end of a 12 foot pole at this point and it was all I could do to get the end of the pole that he was on back into the house without knocking Michael in the teeth with the other end of the pole. As soon as I released him, Tucker shot out of the loop and ran into the house not to emerge again until much later that night. Had Tucker fallen, there were 2 neighbors on the ground with an outstretched tarp to catch him. There were a few tense moments, but in the end the rescue pole saved the day and Tucker was back inside where he belongs. It took him a few hours to come out from his hiding spot after the traumatic rescue, but I got a text from the owners saying that during the night he had reemerged to climb up onto the family's 8-year-old child's bed. Sorry, I didn't get any video since I didn't have my tree climbing gear on.